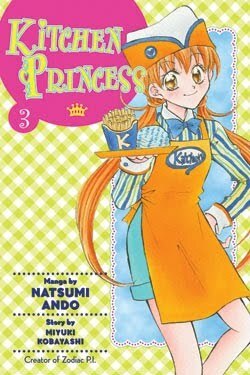 Kitchen Princess Volume 3 is now included in Kitchen Princess Omnibus Volume 2. It is out of print as an individual volume. 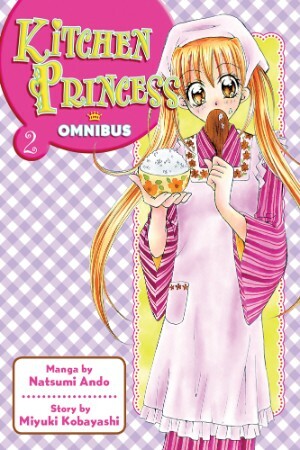 –> Purchase Kitchen Princess Omnibus Vol. 2 from RIGHTSTUF! Akane begins a shift in attitude toward Najika as thanks for Najika’s help. Even as Sora and Daichi help Najika at Fujita’s cafe, their father is fueled to shut the place down thanks to Akane’s friends. Akane ends up encouraging them not to give up and Najika surprises VIP guest by preparing food that is as good or better than the fancy catering service that had been ordered. When Najika gets word that her elderly guardian at Lavender House is ill, she takes off to Hokkaido with Sora and Daichi coming along. While there, a near accident has Najika believing that Daichi might be her Flan Prince, something seen and heard by Sora. After her guardian recovers and they make a carrot cake for the orphans of Lavender House, the trio return to Tokyo where Akane is not happy to learn that Daichi went off on a trip with Najika. Meanwhile, Sora is on a trip to Paris and tells Najika he has something to tell her when she returns. Daichi buys Najika a watch for a present and leaves it on her dorm door. However, a jealous Akane steals the watch. I suppose that with both Sora and Daichi as the lead romantic interests for Najika, one of them will end up being her Flan Prince. Kobayashi-sensei is playing it cagey though by having Daichi save Najika from an accident but have Sora see that incident and hear their conversation in which Daichi basically denies being the Flan Prince even though the spoon she saved is identical to the ones in Daichi’s house. Sora’s telling Najika he has something to tell her smacks of him confessing that he’s the Flan Prince. Well, that would allow Najika to be romantic with him, something she already is, and would allow Akane to pursue Daichi. Speaking of Akane, she’s been shifted from the pure “I hate Najika” to “I don’t care” while doing a bit to show she cares but then stealing the watch Daichi bought for Najika. Still, I suspect that this manga series will follow a simple shoujo pattern in that the former rival will end up being the heroine’s best friend. We’ll see though. Being a Del Rey release, the standard honorific retention rules are in place and there are some translator notes. The recipes for the various dishes that were made in this volume are also presented. I Love the series! and i do have to agree wiht u it does have that younger feel to it! eventhough i am still new to the manga myself but towards the end it feels like a roollercoster ride!